*Our solutions will not turn you orange! Awaken Sunless Tanning Solution from Kahuna Bay Tan is a new fresh scented Anti-Aging formula which was developed to give you a flawless even fading Sunless Spray Tan with benefits yet to be realized in a Sunless Tanning product. Kahuna Bay Tan is known as a producer of excellent Sunless Tanning Solutions, products that are both skin beneficial and provide impressive consistent results. Our newest formula, Awaken, has exceeded even our stringent expectations. The current beauty market is filled with a plethora of Anti Aging products. 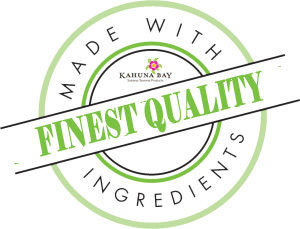 Kahuna Bay Tan set out to create a Sunless Tanner, which along with positive performance, would utilize cutting edge technologies to promote youthful healthy skin repair. Awaken is enriched with Vitamin E, Vitamin A, and Vitamin C Liposomes that condition, and assist in minimizing skin aging free radicals, which contribute to long-term skin damage. CoQ10 paired with Green & White Tea extracts provide well documented skin soothing antioxidant benefits. Awaken delivers advanced moisturizing and skin care benefits via Phospholipid Liposome technology, in addition to inclusion of natural Aloe Vera extracts, one of the best products you can use for skin repair. Awaken also includes the newest powerful Anti-Aging complex Matrixyl 3000 (Pentapeptide-3) which has been hailed as “the new Botox” without the needle. These Anti-Aging ingredient benefits reach optimal performance with daily applications, as studies have shown. But through their inclusion in Awaken, you will feel the skin healing benefits with the very first application. Awaken applies like silk, goes on smooth and your skin will feel like you have just had a full body moisturizing treatment. Referred to as the “Lily of the Desert,” the Aloe plant grows in arid desert areas throughout the year. Its thick green leaves envelope the transparent rich Aloe Vera Gel. This plant has the unique ability to retain water, enabling it to survive in dry climates. Aloe contains health-promoting components, such as vitamins, minerals, enzymes and essential Amino Acids, and protects the skin from dryness. Antioxidants in skin care include the antioxidant vitamins E and C, and beta-carotene. They work by destroying free radicals (oxygen molecules that contribute to cell level inflammation and collagen break down, which leads to wrinkles, sagging, and poor skin tone). Powerful antioxidant. Helps diminish the appearance of fine lines and wrinkles. Strengthens the skin's defense against sun damage and pollutants. A cosmetic active proven in clinical studies to improve wrinkle appearance more rapidly than Retinol. Matrixyl 3000® was designed to promote collagen production while strengthening the essential structure of skin tissue. Matrixyl 3000 remarkably encourages skin tissue to restore itself to a more youthful strength while promoting deep tissue repair. When skin is wrinkled, tiny cells called fibroblasts help to repair the damaged area by forming new tissue. Part of the fibroblasts job is to produce new collagen, an essential component of connective tissue. Although fibroblasts never completely lose their ability to create more collagen, with ageing, levels dwindle, and skin loses suppleness and support structure and begins to wrinkle. Matrixyl 3000 stimulates fibroblast molecules in the skin, enabling them to significantly reduce the appearance of wrinkles. Vitamin A (Retinyl Palmitate) plays a key role as an initiator of cell growth and protein production. It works to normalize the skin ensuring that it is functioning at an optimal level. The use of Retinyl Palmitate Polypeptide - a glycoprotein complex containing retinyl palmitate, will not only help to optimize the efficient normal working of the skin's cells; but, provides additional moisturizing and protective qualities to the skin. A potent antioxidant and very effective free-radical scavenger, is especially beneficial for dry or damaged skin. Known as "the skin vitamin", it acts as a keratinization regulator, helping to improve the skin's texture, firmness, and smoothness. Vitamin A helps prevent skin dryness and scaliness by hydrating and softening the skin, keeping it healthy, clear, and infection resistant. It is used for anti-aging products due to its ability to stimulate new cell production, which is enhanced when combined with vitamin E. When vitamin A is incorporated into skin care products at adequate levels, it will increase cell proliferation in the epidermis, stimulate fibroblasts to produce elastin and collagen, and induce new blood vessels to grow, all of which result in healthier and younger looking skin. Considered the most powerful water-soluble antioxidant, is also one of today's most dynamic natural skin care ingredients. It has been clinically shown to reverse photoaging (wrinkles and age spots) and boost the skin's collagen production for smoother and firmer skin. In addition, vitamin C inhibits UVA and UVB radiation-induced damage, also resulting in younger looking skin. Considered the most important oil-soluble antioxidant and free radical scavenger, has numerous skin care benefits. In order to efficiently utilize oxygen and keep skin cells at their optimum health, skin tissue requires vitamin E; it is one of nature's most dynamic cellular renewal and healing ingredients. It is also an extremely effective moisturizer that is easily absorbed by the skin. Vitamin E is known to improve the appearance of rough, dry, and damaged skin by reducing transdermal water loss and, when combined with other vitamins, it moisturizes from within. Some clinical research shows that vitamin E can help maintain the skin's connective tissue, helping it stay smooth and elastic. Vitamin E is a photoprotectant and helps shield the cellular membrane from free radical damage. Studies show that when applied prior to UV light exposure, vitamin E helps protect against epidermal cell damage. Extracted from the embryo of the wheat kernel. An anti-inflammatory and skin nourisher that also acts as a natural preservative because of its high vitamin E content. The benefits of green tea to the skin have been widely documented. This powerful antioxidant (20 times stronger than vitamin E) inhibits the formation of cancer-causing free radicals and helps prevent skin cell damage caused by sun exposure and pollution. An important ingredient in sun care products, as well as in creams, lotions, shampoos and conditioners. An anti-inflammatory and ant irritant, it is high in xanthines, very soothing and moisturizing to both hair and skin. We use powdered Matcha green tea from Japan, known as one of the finest sources.